In the holiday season we asked our four daughters what memories they recall about the benefits, fun, struggles and surprises about traveling with us until they finished high school. They all stressed how much they learned about how people in various parts of our country and the rest of the world lived and had different customs. ms-- not just focusing on historical facts. She did feel that "visits to any more cathedrals were more than a bit too much"---so we listened and adapted. We were still in the days then of flat tires, running out of gas and emergency bathroom stops, sometimes in the nearest woods. When Debra, daughter No. 2, heard a long ago friend say, "If you don't like inconvenience, don't travel," she laughed and said that "traveling was a challenge that helped me improve my problem solving skills. I certainly learned how to use a map in planning trips--long before GPSs became available ." 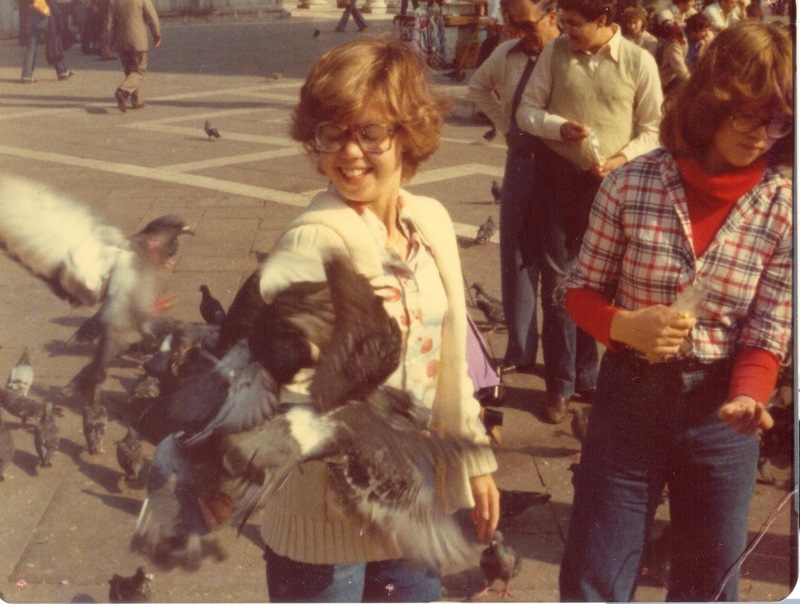 When Rosalyn, born exactly six years later than Debra, said that "Traveling broadened my mind about the differences in how other people lived. I mostly had a great time, but I did have some concerns." When she went to the third grade for three months in a small town in England, she missed a few recess times because she refused to eat the liver and cabbage offered. She was also concerned that "I may lose my best friend if I am gone a year!" When her sister Stephanie was in the first grade there, she was a little surprised to be called a Yankee. A rule that surprised her was that girls had to wear skirts, not slacks, unless the weather was bitter cold, but she coped rather easily. When we were taking a long walk in the woods, she sat down in the middle of the path and said, "I'm really getting tired of getting toughened in." She came back to the U.S. with the cutest English accent. Both sisters enjoyed being surrounded by students-- a nice break from being home schooled as they lived in four countries in that year learning about Europe. Traveling with children gives them an opportunity to see and do things in the world in a way present digital equipment does not allow. They may hold all the knowledge in the world in the palm of their hand, and be connected instantly with all of their friends but that kind of lifestyle does not include the reality of skiing down a mountain, canoeing on a lake or cooking a meal over an open fire. We discovered the joys of traveling with children with our first two daughters when we lived in Maryland on Chesapeake Bay. 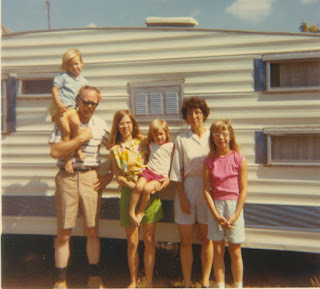 In our free time we explored the east coast camping in a tent, cooking our food on a gas burner and bonding us as a family. 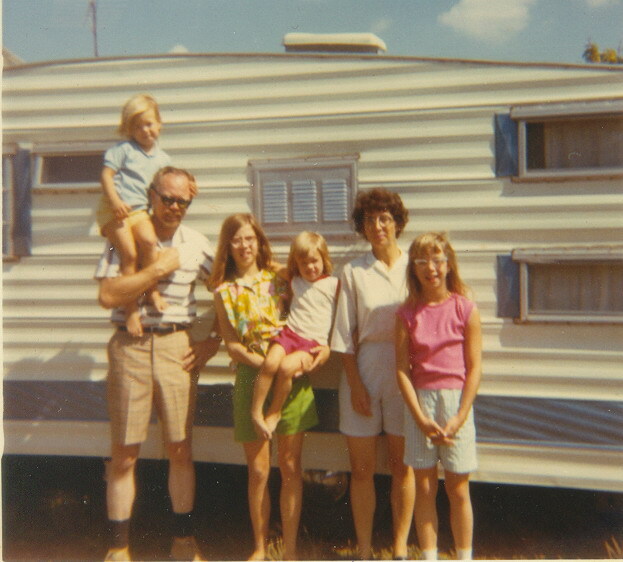 When we returned to Columbia in 1963, we shortly added two more daughters and decided to add a travel trailer. We started exploring the west: Petrified Forest, Grand Canyon and Colorado with its ghost towns and skiing sites. Wayne was able to take sabbaticals for a year each in 1972-73 and 1978-79 and several summers to teach for the U.S. Air Force in Europe-- eight different villages in five different countries. We took folk marches with the natives in Germany and Italy and had them as next door neighbors. In Italy we only had our two youngest daughters with us who were then 12 and 10. Italy was their favorite country, because of the food, the friendly people and its multiple attractions especially Rome, Venice and Florence. Jerilyn and Debra were able to join us to see some of the Italian sites. During this time we were also still traveling to visit family around the country and attending family reunions--one with our relatives in Sweden. We continue our travels with family members. Rosalyn's children took a Road Scholar week with us in Northern Minnesota where we took the ropes course, canoed and learned how to navigate with a compass in the woods. Stephanie's twin daughters have traveled with us frequently to Tennessee sites. We are looking forward to continuing traveling as long as we can and having a Merry Christmas with our extended family. In Cork, Ireland we all had a chance to kiss the Blarney Stone, which gives you a special power with words.